As Premier League action returns this weekend, Elysium Magazine wanted to take a closer look at the managers likely to contest the big prizes come May 2014. Based on the leagues’ top four clubs according to respective finishing positions last season, these managers will be charged with the biggest challenge of all – winning silverware. All four men embody hugely different management and playing styles so a closer examination can help the discerning gent uncover who has exactly what it takes to succeed this season. 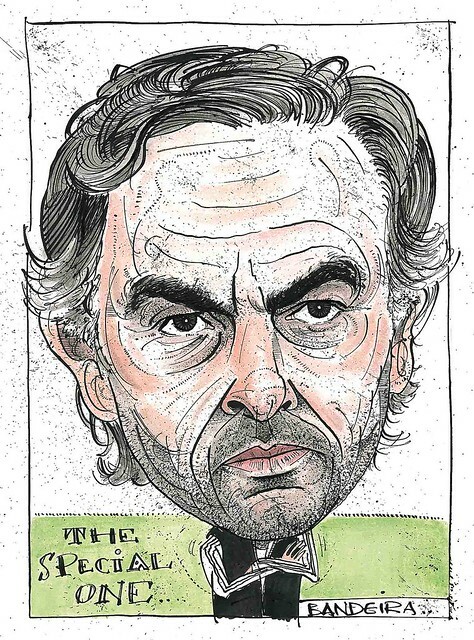 As an added bonus Elysium Magazine has enlisted the help of talented illustrator Graeme Bandeira to depict an image of the managers in his own unique way. Sit back, read and enjoy! 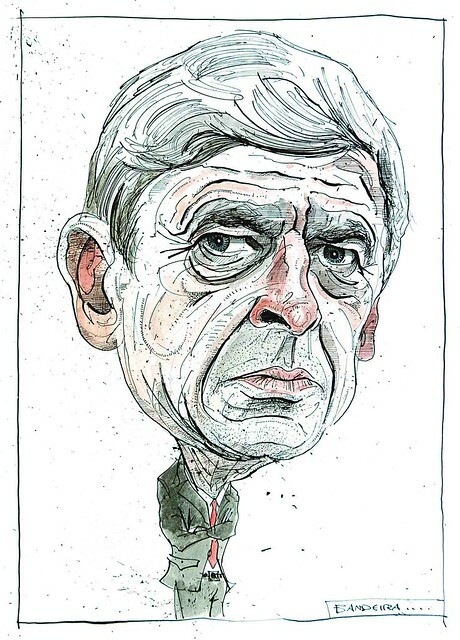 Now the Premiership League’s longest serving manager following the retirement of Sir Alex Ferguson, Wenger is perhaps entering a pivotal moment in his Arsenal career. Devoid of any trophy triumph for eight long years the pressure is really on to win silverware this term. Known as the ‘Professor’, Wenger has a philosophy of the game that is easy on the eye for the neutral: flowing attacking football with plenty of intricate passing in the opposition half. Over the years though it has become apparent that Wenger won’t buy ready made stars. His preference is to nurture young talent into world class players – it’s the long term view he has. The only problem here is that bigger clubs then swoop in to buy Arsenal’s best players just when it looks like the squad is ready to challenge. Wenger is stubborn in his beliefs though and keeps faith in this. He’ll benefit from having a fully fit Jack Wilshere available from the start of the campaign, while Alex Oxlade-Chamberlain and Theo Walcott provide energy and pace on the flanks. The team still lacks a star striker but if Luis Suarez makes the move to North London then this team could well go all the way, or at the very least make a decent challenge. A lot has been said about taking over from arguably the greatest manager of the British game and Moyes knows all eyes will be focused on him. He’s not a man to take the spotlight so it’s something he’ll need to get used to very quick or find a cunning way to deal with it. The trait that will serve Moyes the most will be that he’s a grafter – he’ll put in the hours and learn all that he needs to know in order to come out on top. But he’s stepping into a team packed with established stars who have won everything in club football so much will be made about how he expresses his own influence on this team. The shadow of Sir Alex still looms over Old Trafford. Moyes being the man he is, has pulled together a supporting team that will help make the transition. Bringing in Phil Neville (coach), Ryan Giggs (player-coach) and potentially Paul Scholes (coach) ensures that he’s using the experience from some of Manchester United’s great players over the years. Moyes will need it too having practically no Champions League exposure from his time at Everton. Moyes has the work ethic to succeed given time, but he’ll need to learn fast. Mourinho has come back to the club he’s said he has a love affair with. The fans love him, the senior players love him and the club owner knows he can deliver. The stage is set for the ‘Special One’ to come good again and success will be expected immediately. But Mourinho loves the challenge, and importantly, the pressure. The Chelsea squad is already pretty strong but Mourinho knows that his warriors of old (John Terry, Frank Lampard, Ashley Cole etc) might not have the legs their youth afforded him during his first spell in charge. However their experience will be invaluable over the course of the season and will help to guide the younger players at the club. The stage is set then for Mourinho to take up the challenge. With major changes at other top clubs the familiarity he already has with the club and a large nucleus of players with certainly give him a head start. Mourinho will no doubt use this to his best advantage and stress to the media that it was something holding him back. Pellegrini, often known as the ‘Engineer’ due to the professional qualification he holds, will probably be the most intriguing new coach in the Premier League this season. This is a man who likes to refer to his coaching roles as ‘projects’ as he strives to find the right formula for the success at each of his previous clubs. It’s a markedly different approach from his predecessor Roberto Mancini who liked to think he ruled with an iron fist, much to the displeasure of the playing squad. Pellegrini brings tactical astuteness to the job in what he prefers as a balanced 4-2-2-2 formation with inverted wingers – coming in from the flank to dictate play. David Silva will be the first to warm to the new manager. Pellegrini likes to know his players, find out what systems they prefer and how he can gain the best from them in a relationship built on mutual trust similar to Mourinho. The similarities stop here however as Pellegrini is anything but the showman Mourinho is. The Champions League is another area where Pellegrini holds vast knowledge of, an important objective for the blue half of Manchester following two abysmal seasons in Europe’s elite competition. 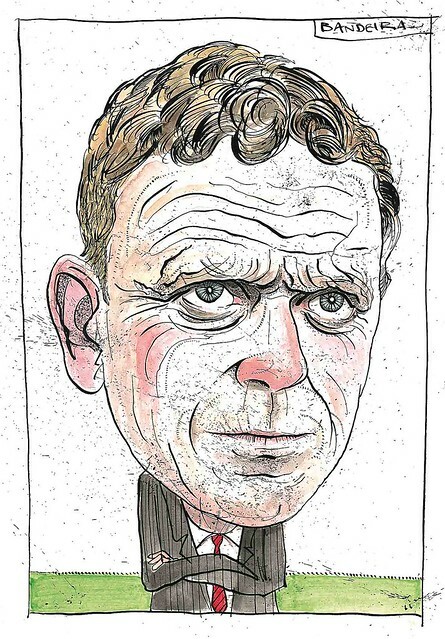 Graeme Bandeira’s illustrations of footballers, managers and politicians can be found at http://altpick.com/bandy, and the man himself can be found tweeting here.